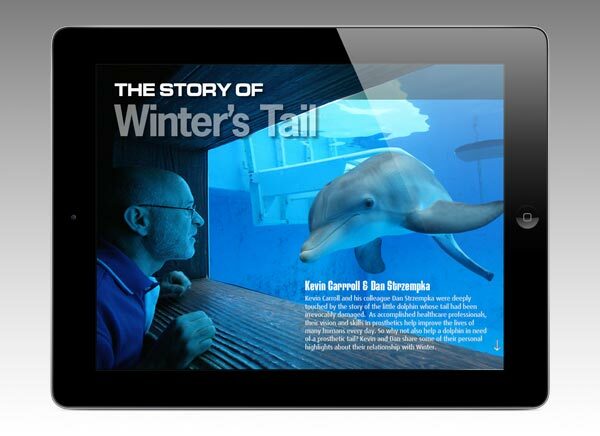 “Wild Dolphins” is the iPad app that features Winter, star of the current movie, “Dolphin Tale” and reveals the greater truth behind her rescue, recovery and prosthetic tail fluke. 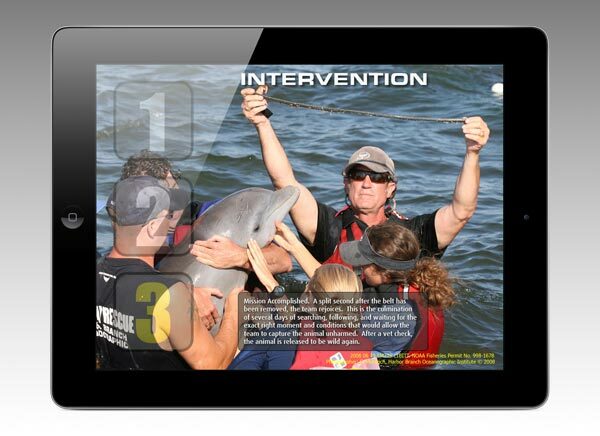 The iPad app, produced by Florida Atlantic University’s Harbor Branch Oceanographic Institute is filled with many poignant stories of wild dolphins that are rescued every year. “Dolphin Tale”, the movie, in theaters now, is based on the true story of an orphaned baby dolphin, named Winter, who survives being entangled a crab trap and gains a prosthetic tail so she can live. 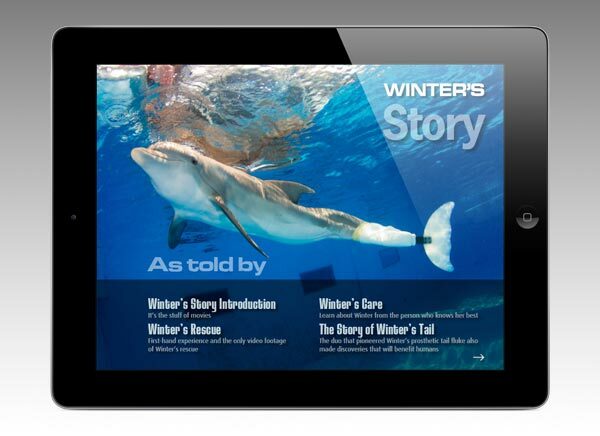 “Wild Dolphins” is the iPad app featuring Winter revealing the greater truth behind her rescue and recovery. Winter is just one of many poignant stories of wild dolphins that are rescued every year, as this app brilliantly shows, introducing, at the same time, the real stars behind the scenes committed to protecting wild dolphins. The content in this App is entertaining, moving and educational. There's the original video of Winter's rescue, interactive blueprints and a rotating element of the prosthetic tail. 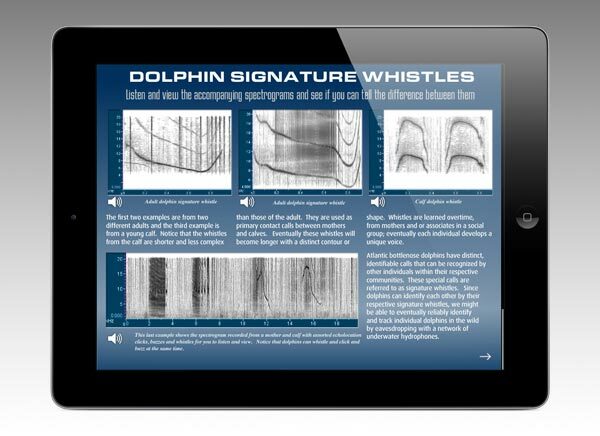 There is a whole educational section about dolphins: where they live in the world, their external anatomy (through a fun interactive element), and actual sound files of dolphins communicating, including a conversation between a mother and her calf. A dolphin doctor, rescuer, trainer, acoustic engineer and the prosthetics design team all share their stories and dreams for their work in protecting wild dolphins. Interactive 40-year time line of the accomplishments of Harbor Branch Oceanographic Institute as it lives its mission, "Ocean Science for a better world"
The section entitled "Dolphins in the Wild" provides up-to-date stories of other entanglements and rescues, and how such entanglements can be prevented. Each article, backed up by science and real lived experiences, is enhanced by beautiful photography, graphics and video. All content is highly informative and provides exciting discoveries about the habits and social life of dolphins. 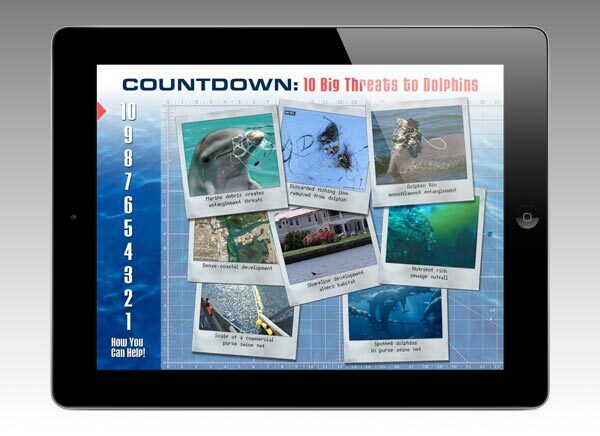 The Wild Dolphin's App is produced by Florida Atlantic University’s Harbor Branch Oceanographic Institute, its Foundation, and Polymash, Inc.
About Harbor Branch Oceanographic Institute was founded in 1971, Harbor Branch Oceanographic Institute at Florida Atlantic University is a research institute dedicated to exploration, innovation, conservation and education related to the oceans. The institute specializes in ocean engineering, at-sea operations, drug discovery and biotechnology from the oceans, coastal ecology and conservation, marine mammal research and conservation, aquaculture, ocean optics research, and marine education. Polymash Inc. is a US-based company whose mission is to transform knowledge and content into exceptional experiences on tablets, web and emerging mobile platforms, offering a full range of app creation services that combine the design, authoring or converting of interactive content for tablet devices, assistance to clients with overall app strategy development and integration, information product design and development, app marketing strategy, services and support. Polymash is a team of experienced IT and publishing professionals, specializing in user experience design, content and language optimization, marketing and social media integration, as well as creative web and graphic design. 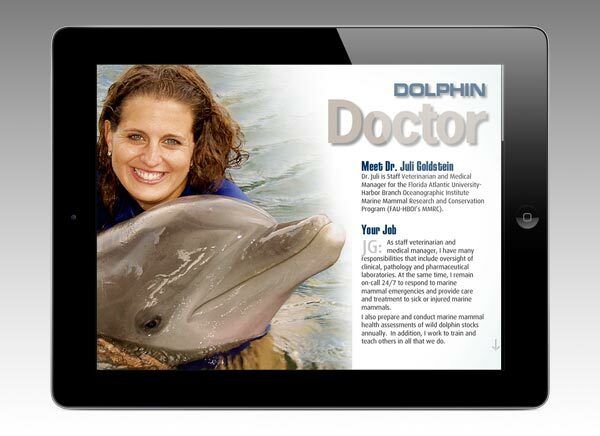 Wild Dolphins is freely available for a limited time worldwide through the iTunes App Store in the Education and Entertainment categories. Stories of Winter's Rescue and RehabilitationMeet those who know Winter best. Dr Juli Goldstein, Dolphin DoctorDr Juli talks about her patients and daily rounds Dolphin RescueRemoving a radiator belt from a rescued dolphin's neck Winter's Tail Up CloseThe team who created and fitted Winter's prosthetic tail fluke 10 Big Threats to DolphinsDolphins face many threats. Shark attacks are the least of it. Sounds of DolphinsListen to clicks, whistles and buzzes of dolphin chatter, and the conversation between a mother and her calf.